Always ask a satisfied customer for referrals! Ask for the names of people who might also like to buy from you. Get addresses and phone numbers and follow-through with a call or card. While this is a common practice among large ticket sales, it can also be used in hundreds of other situations. Suppose you call people to introduce yourself and invite them to come to your business. Most people will be surprised and pleased by a personal invitation like that. And it beats sitting around hoping someone will come in. Of course, the more information you can get about a referred person the better. But don’t make giving referrals a big job for your customer. A name and address or phone number are all you need. You can look up other data if necessary. Do You Work With Businesses In Canada? Obtain either express “opt-in” or implied consent to send commercial electronic messages (CEMs), including emails and certain types of social media messages. Pre-toggled or pre-checked in boxes will not be allowed. All electronic messages will need to clearly and prominently identify the sender, including the sender’s contact information. Must provide an unsubscribe mechanism. Organizations that don’t follow the law could receive penalties, including criminal charges, civil charges, personal liability for company officers and directors and penalties up to $10 million. It all comes down to asking and treating others as you wish to be treated. Tip for Email Marketer — Offer Resources! Prospects need to feel valued. By providing resources such as whitepapers, guides, tools, and webinars, you can deepen your relationship with prospective customers. Provide content that gives subscribers the ability to buy into your product and/or brand. Don’t leave them feeling like you’re just trying to sell them something. The Horizon Council and the Lee County Economic Development Office have announced finalists for the annual Industry Appreciation Awards on Oct. 12 at the Hyatt Regency Coconut Point in Estero. A panel of local business and community leaders served as judges for the awards. The finalists for the Business Citizenship Award are Aubuchon Homes, Florida Skin Center, Pushing the Envelope and Sanibel Captiva Community Bank. Finalists for the Nonprofit of the Year Award are Child Care of Southwest Florida, Florida Gulf Coast University Foundation, Lee Health Foundation, PACE Center for Girls, Sanibel-Captiva Conservation Foundation and Valerie’s House. The finalists for the Diversity in Business Award are Conric PR & Marketing and Forum Chiropractic. Finalists for the Start Up of the Year Award are Apex Property Restoration, East and Greenwell Insurance, and iPartner Media. And the finalists for The Business of the Year Award are Norman Love Confections, Spiro & Associates and Wilrock, LLC, doing business as Jason’s Deli. Visit www.leecountybusiness.com or call 239-338-3161. Entrepreneurs in Southwest Florida will build real companies from scratch during Startup Weekend, an entrepreneurial program that already has been held in 700 cities worldwide. The inaugural event will take place Oct. 6 to 8 at Endeavor Innovative Workspaces. $70 per person and $25 for students. Go to startupweekend.org and type “Fort Myers” in the search field. Speakers and judges for Startup Weekend in Fort Myers will include Louis Bruno, president of Bruno Air Conditioning; Norman Love, chef, president and founder of Norman Love Confections; and Bud Stoddard, a serial entrepreneur and founding member of Tamiami Angel Funds. Although venture-capital investors will be present, entrepreneurs will not be competing for investments. However, non-cash prizes such as branding consultations, website development and office space will be awarded to the winners. Are you having trouble getting the response you would like from your social media accounts? Here are some great tips to get your posts, pages and profiles seen by more potential consumers. 1. Create More Video Content: It’s no secret that consumers respond to visuals such as videos. Utilize Facebook live and others as much as possible. 2. Social Media Marketing Is Going Mobile: Make sure your website is mobile friendly. 3. You Don’t Have to Do Everything: Use social media sites that relate and will benefit your company most. 4. Make Your Marketing Efforts More Focused: Concentrate on the message you would like to send your followers and potential consumers. Try to remain focused with your posts and articles. 5. Influence Marketing Is All the Rage: Encourage past and current customers to leave feedback and ratings on your social media accounts. Word of mouth! 6. Find a Way to Benefit from the Changes: Make sure to stay current with all the new features your social media accounts are offering. Many are FREE. 7. Analyze the Success of Your Content: Once a post has gone up, make sure to check back to see people react, share or comment. This will help with planning more successful posts in the future. 8. Audiences Love Info-graphics: Say what you need to in high quality graphics or images. Once again, good visuals are an eye catcher. 9. Facebook Advertising Is as Powerful as Ever: YES! Utilize Facebook! We tell all our clients Facebook is the number one site to advertise. Make sure to create a Business Page and post from there. 10. Content Is Still King: Your company will be judged on the context of your posts. Keep it professional and topic related. You should always find the right images to accompany your articles, website content, blogs, white papers, etc. Images are critical in attracting your readers. We’ve all heard that pictures speak 1000 words! Let’s Have Some Fun at the casino. Are you feeling lucky? 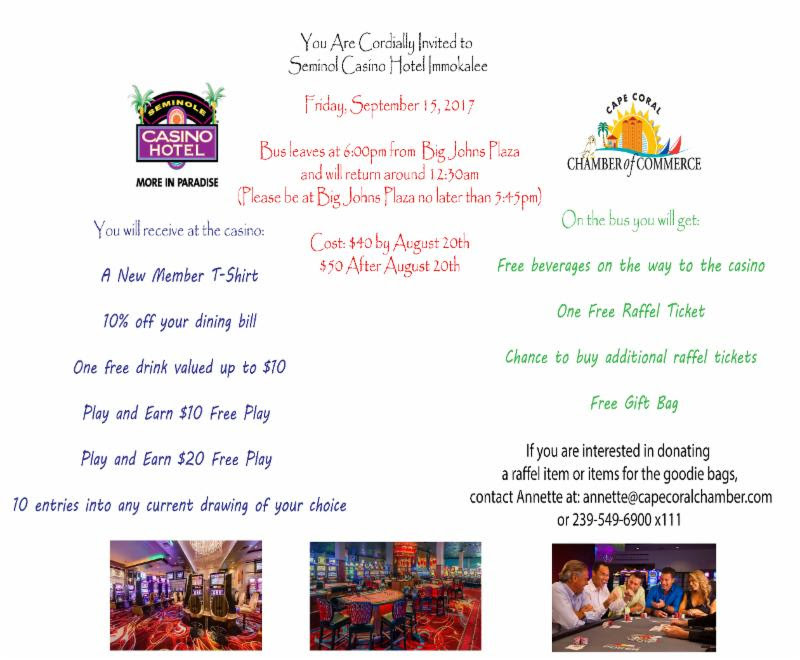 Take a Load Off, Cut Loose, Join Us For Some Fun At The Casino! The bus will leave promptly at 6:00pm from Big John’s Plaza. Early Registration is available for a discount until August 20th. There is limited seating, and all reservations are on a first come first serve basis. Customers hate a ‘love’em-and-leave’em’ relationship. Yet most salespeople offer just that. Once the sale is made the customer goes back to feeling like a stranger. Look for opportunities to contact the customer after the sale. Establish an ongoing friendship and they’ll keep coming back. Call to be sure the product/service met their needs. Send out new product information. Email items of interest or newsworthy information that may reassure the customer of his good purchasing decision. Invite them to participate in a focus group. Call to thank them for referrals. Leading Edge Benefit Advisors, LLC is offering a Benefits University seminar on September 7 at Florida Gulf Coast University, located at 11090 FGCU Boulevard North in Fort Myers. The half day course will provide business owners and human resource executives a practical approach to handling legal issues that may arise within human resources and employee benefits. It will also helping employers recruit and retain a superior workforce. The event will feature employment law expert Christina Harris Schwinn, partner at Pavese Law firm. In addition, health care reform specialist Danielle Horstman Capilla, Chief Compliance Officer for United Benefit Advisors will be featured. Both will be offering insight on navigating the challenges businesses face. The cost is $35 per person. It includes a continental breakfast, as well as three Society for Human Resource Management (SHRM) continuing education credits. For more information, contact Mercedes Lawler at (239) 433 -4471. Register online at http://conta.cc/2sGwZAu.